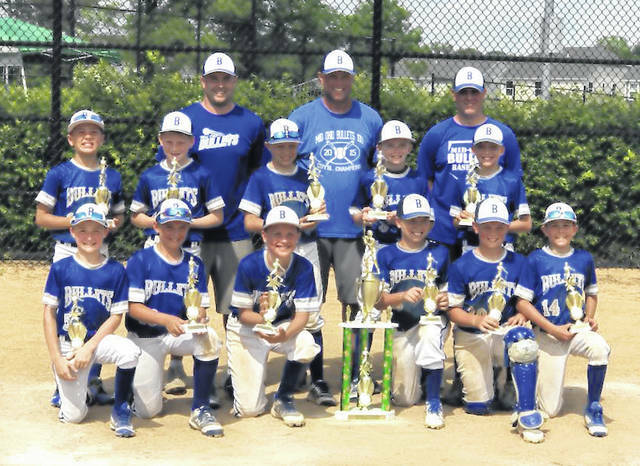 The 2018 10U Mid Ohio Bullets finished their season during the weekend of June 15-17, tallying a 30-3 record. The boys finished 8-0 in the Stephen Gussler Division of COYBL, which was classified as the strongest division out of the 10 division, 50 team league. In addition, they won three tournaments this season (Spring Shootout in Grand Park, Indiana; Upper Arlington NIT and Dublin Wayne Williams Memorial Tournament). Over the last three seasons, the players have finished with an 89-7 record, three COYBL league championships and eight tournaments, two of which were state championships. Pictured are, back row (l-r): coaches Jon Hatfield, Travis Church and Will Taylor. Middle row: Brody Hatfield (Big Walnut), Trevor Brubaker (Northmor), Caden Beck (Delaware Christian), Eli Snyder (River Valley), Cameron Patterson (Big Walnut). Front row: Brady Carr (Northmor), Brady Pavlak (Big Walnut), Luke Chilicki (Olentangy), Jayden Collins (Highland), Zach Church (Highland) and Brady Taylor (Big Walnut).